Manoj Pontificates: But Catholics don't consider Mary to be God! I had posted this cartoon from atheistcartoons.com on my facebook a/c. And I got the following feedback. Catholics do not consider Mary or the angels to be God(s). There is only one God. Anyone who has attended Catholic catechism classes will know that they really only believe in one God. The virgin Mary, mother of God is not a God herself but a saint; a super-saint if you will, accorded a status above all saints. Also Angels, in Catholic theology are not Gods. Nor are the rest of the saints. So, are atheists like me making fools of themselves by claiming otherwise? Not really. No. Here is the claim. Catholics do profess to believe in one God. But they do pray to Mary, the archangels, the guardian angels, saints and even dead people whose souls are presumed to be in Heaven (holy souls). The important distinction is that the Catholics do not worship them as God. They do not consider them to be in the same class as the 'one true God'. They angels are divine beings with supernatural powers. They often act as messengers of God. They also can at times fight the devil/Satan, sometimes on your behalf. Then there is Satan or Lucifer and his minions or the fallen angels. These are also divine beings, also with supernatural powers; but evil ones. Catholics pray to the good angels to keep the bad ones away. Children are often taught to invoke their (personal) guardian angel to stand watch while they sleep. The saints come lower down the hierarchy. 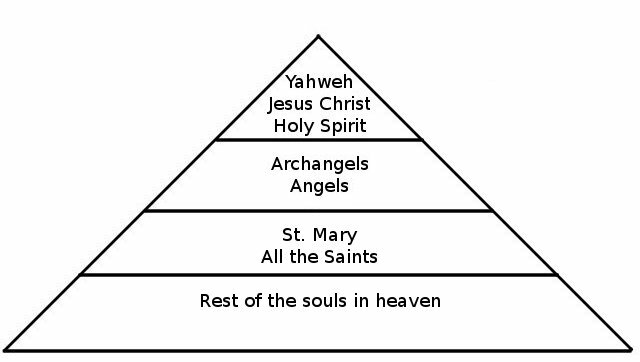 But the saints have a hierarchy too. The virgin Mary is the holiest of them all, having been born without the original sin (immaculate conception) and having ascended to heaven (assumption of Mary) with her human body and soul and of course having given birth to the almighty God, Jesus Christ on this earth. A dead soul does not have to be canonized as a saint to be one. 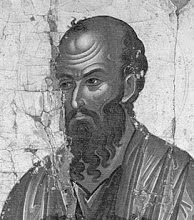 A saint is a saint whether declared as one or not. A declaration just clarifies things for the lay people, so that they know who to focus on in their prayers. The angels and saints have specializations, I kid you not! St. Anthony of Padua, is the patron of lost things and missing persons. So, if you lose a wallet or if your GPS malfunctions, St. Antony is the one to go to. St. Joseph is the patron saint of workers (he being a carpenter, he would understand the issues), St. Francis of Assisi the patron of ecologists, Francis de Sales the patron of journalists and writers (and bloggers? ), St. Michael, the Archangel, the patron of grocers, mariners, paratroopers, police, and sickness and so on. Going to the right saint is like going to a specialist. Then you have got the rest of the dead souls who are in heaven - the holy souls. They can also intercede on your behalf. You can pray to them and they in turn can pray for you, to the one true God. Hey, influence helps, even in heaven! And on top of all, there is the one true God. And in Catholic and most (though not all) Christian theologies, the one true God is actually composed of three personalities - the Father, the Son, Jesus Christ and the Holy Spirit, together forming the holy trinity. They are three, but one. It is quite simple. In case you are confused, let's let the fourth Lateran Council clarify it for you. "It is the Father who generates, the Son who is begotten, and the Holy Spirit who proceeds". When I was a practicing Christian, this was one of those fundamental tenets of my faith that never really made sense and was filed away as 'that's how it is'. So, in reality, what you have is a hierarchy of divine, supernatural entities. Here is the hierarchy. 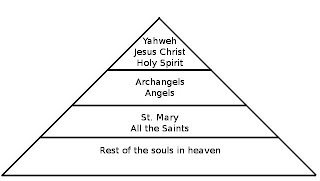 Catholics do have a hierarchy of divine beings. And they do pray to all of them. The top three (or one) are designated as Gods. The rest just quack like secondary and tertiary Gods, just not officially termed as such. The (excessive) veneration of saints was in fact an issue that flared up during the Protestant reformation. The other aspect of the cartoon is the suggestion to pray for 'the heathens'. Well, Roman Catholicism no longer teaches that the Jews, people of other faiths and non-Catholic Christians will automatically go to Hell and burn for all eternity. But that does not make the centuries of tradition of teaching exactly that, vanish into thin air. Also, in practice, many or most Catholics do not tune in to the latest from the Holy See. For instance, when I was studying for my holy communion, a nun categorically denied evolution and cited the fact that 'monkeys do not beget humans' as proof. She was completely unaware that Catholic Church at that time considered evolution to be "completely compatible" with its theology. This is far from uncommon.